In some ways Danny Bayasan is out of place. He’s a Filipino living in Africa and a Christian working among Muslims, yet he feels ‘at home.’ While Danny studied at the Asian Center for Missions in humid Manila, he felt God challenge him to take on one of the biggest and toughest assignments on the mission field.In those days, Danny could hardly have imagined he would one day be in the middle of dry sub-Saharan Africa sharing his faith with the unreached tribal peoples of Burkina Faso. “I am a Filipino,” Danny said smiling, “from the mountains (not the desert). People ask me, ‘Why go to another continent, especially Africa, so far away from home?’ I say, ‘I believe God has laid this burden in my heart.’ ” Danny felt particularly called to minister to the Fulani, a nomadic tribe who live in straw huts; they are spread across West Africa.He told us about them, with the air of telling us about his family. ”The Fulani people group are the biggest unreached people group in the world. There are about 24 million of them across the Sahara and many of them have not even heard the Gospel, even once.”Danny and his team travel into the vast semi-desert wilderness and make regular visits to remote villages. In this dry inhospitable climate, water is scarce. Drilling a well for the villagers has made the Fulani appreciate Danny and the message he wants to share with them. Pastor Danny Bayasen was able to appoint leaders for the church in Burkina Faso (Africa). After three years of discipleship, training and prayer, October 26, 2003 marked the day of consecration for the different ministry heads. They have also setup a Christian Youth Resource Center to train, evangelize and eventually send out young people, especially those from University. Their literacy classes have also been used mightily by the Lord to reach out to young people and children. Due to lack of funding for classrooms, chairs and tables, many children had to be turned down. 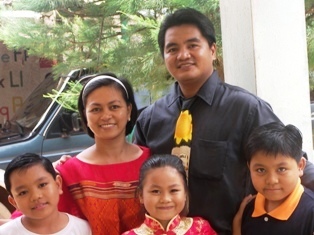 This entry was tagged Burkina Faso, Danny Bayasen, filipino missionary, means, philippines. Bookmark the permalink. Great to read about Danny Bayasen and lovely to see a picture of him, Ruby and their children. We worked with them in Burkina Faso. Kindly pass on my best wishes and it would be great to hear from thyem..